Mass Suicide Occult Figurines reissued on 200g QRP vinyl!! My first solo record, Mass Suicide Occult Figurines, originally released by Barsuk in 2000, is getting reissued by the Native Sound. The preorder link is now LIVE. We remastered it with Bob Weston at Chicago Mastering Service. I think it sounds oh so much better. Bob also cut the lacquer. QRP, of Solina, KS, is doing the vinyl. They are clearly the best pressing plant in the world right now. The entire run will be 200g black vinyl. The only way to fly. Brand new art by the legendary Joe Williams. The flexi songs are really special. I’m really proud of the way all of this came together. Julio at The Native Sound has done a wonderful job with the reissue. Let’s reward his faith in excellent sounding reissues by locking one up!!! Published on March 16, 2015 by John Vanderslice. Join us for Tiny Telephone’s 17th Anniversary party!! Free beer, DJs and awesome people. Published on November 05, 2014 by John Vanderslice. Phono Del Sol #4 is coming to a skate park near you. 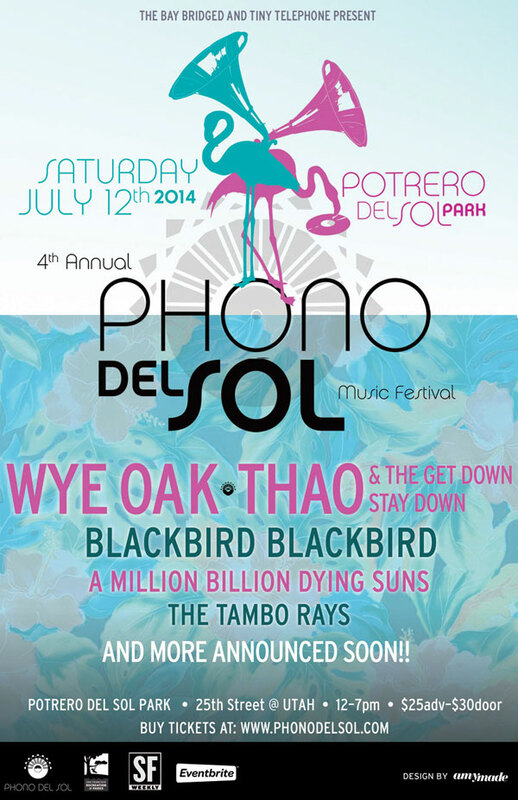 “The Bay Bridged is proud to announce five great bands performing at the Phono del Sol Music Festival on July 12, 2014 at Potrero del Sol Park. The fourth annual festival celebrating the best of independent music will be co-headlined by Baltimore’s Wye Oak in their exclusive San Francisco Bay Area performance in support of their acclaimed new album Shriek. Also at the top of the bill are SF favorites Thao & The Get Down Stay Down, hands down one of the best live bands around. They’ll be joined by eight other bands at the festival, three of which we’re announcing today. SF’s Blackbird Blackbird will be bringing anthemic electronic pop to Phono, fresh off the June release of Tangerine Sky. There will also be performances by SF/LA transcendental rock band A Million Billion Dying Suns and local rock and roll party-starters The Tambo Rays. The five remaining Phono del Sol 2014 bands will be announced soon. Published on May 12, 2014 by John Vanderslice. I’m taking most of the year off to produce records and build the new Tiny Telephone Oakland. I will be playing 4 Bay Area shows this summer. They are all pretty special. Published on May 11, 2014 by John Vanderslice. Published on December 17, 2013 by John Vanderslice. Magik*Magik Orchestra 5 Year Anniversary!!!! 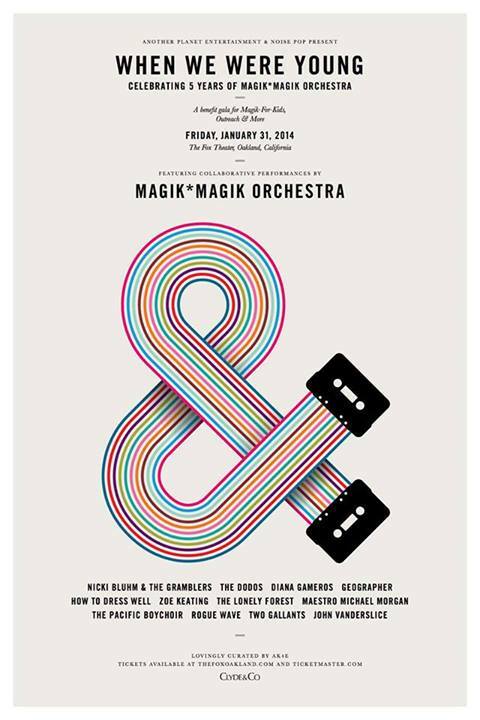 On January 31st, my beloved group, Magik*Magik Orchestra, celebrates our 5th birthday at the Fox Theater. Over the past five years, Magik has had the honor of creatively contributing to over 100 artists’ projects and over 450 songs. We would like to share some snippets of those collaborations with you in one beautiful evening of curated music featuring orchestrated guest performances by: The Dodos, John Vanderslice, Zoe Keating, How To Dress Well, Two Gallants, The Lonely Forest, Geographer, Rogue Wave, Nicki Bluhm & The Gramblers and the lovely Diana Gameros. 30 young singers from the hauntingly gorgeous Pacific Boychoir will make guest appearances on a number of songs throughout the evening as well. There will be only 1500 seats available for purchase to this special evening. Come claim yours this Thursday at our presale. Password is mockingbird. TICKETS HERE. Hey, I just packed the van with Vanderslice Plays Diamond Dogs and Dagger Beach 200g vinyl, new t-shirts, flexi singles, screenprinted posters, and these weird reflective plastic discs they call CDs. I only have 165 Diamond Dogs records left (he bolds for maximum impact). Diamond Dogs is streaming here. Please come to a show near you!!!! It’s going to be my last club tour until 2015. I’ve got to build this Oakland studio next year. Also, my cats, Miette and Clover, have made it very clear I need to stay home. I’ll have the superb Jason Slota on drums and Moog Source and Tiny Telephone’s awesome Jacob Winik on sound. Jason and I are going to play tons of stuff we’ve never played before: “Harlequin Press,” “Sleep It Off,” “How The West Was Won,” “Song For Dana Lok,” and some songs from Diamond Dogs. As always, we’ll have amazing support bands, including Bent Shapes, Alexander and the Grapes, Jared Bartman, Samantha Crain, Doe Eye, and Prism Tats. Published on October 15, 2013 by John Vanderslice. What’s not to love? If you can do any of these cities, write me. We need people in St Augustine FL, Tucson AZ, and Phoenix AZ. Check the dates on the right side of this page. Thanks!!!!!!! Published on October 10, 2013 by John Vanderslice. FALL TOUR DATES are ON!!! Hello everyone! 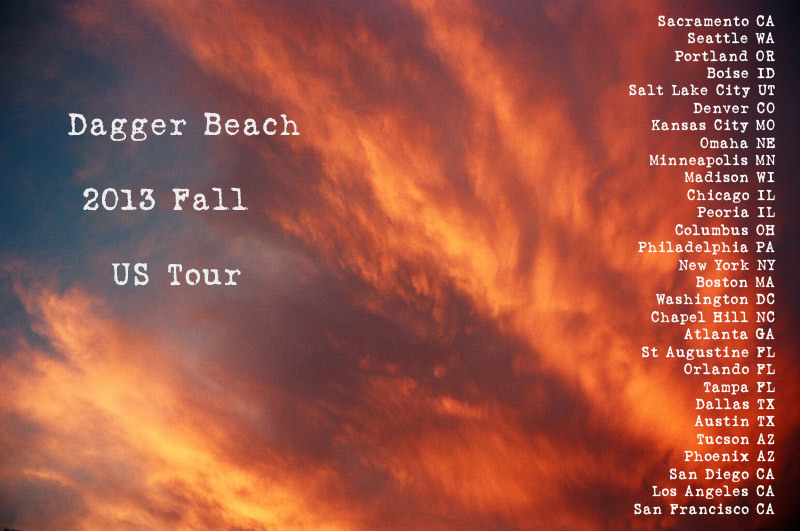 My fall club tour is happening and all the dates and (some) ticket links are below. 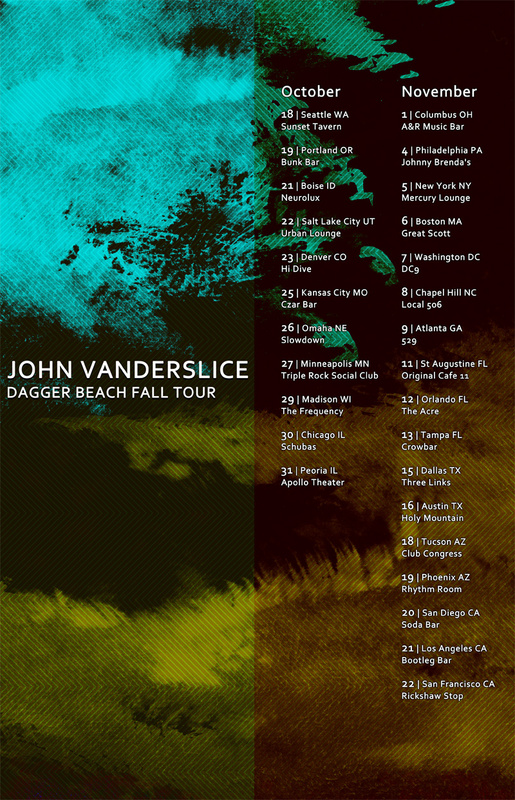 This will be my only club tour until 2015 so PLEASE PLEASE come to this if you can. I’m knee deep in building a new Neve studio in Oakland and I’ll only be playing living rooms next year. I’ll have the amazing Jason Slota on drums and Moog Source and Tiny Telephone’s lovely Jacob Winik on sound. As always, we’ll have amazing support bands, including Samantha Crain, Doe Eye, and Jared Bartman. More bands announced soon! Published on August 12, 2013 by John Vanderslice. This backer-only song from the Kickstarter campaign is the Native Sound’s first release! 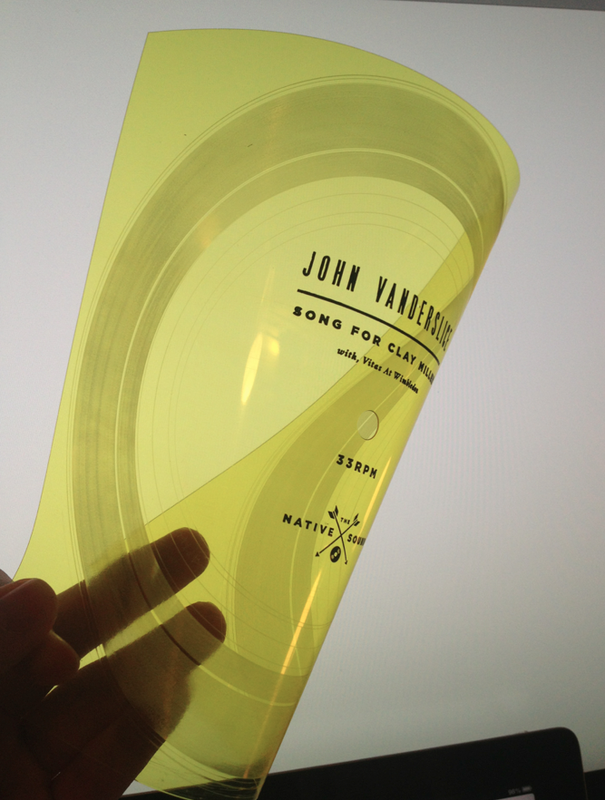 It’s printed as a beautiful yellow or translucent flexi 7″ with really nice artwork. You can stream it here or buy it at The Native Sound. The B-side is the unreleased “Vitas At Wimbledon.” This is SUPER limited, the green flexis sold out right away. Published on August 02, 2013 by John Vanderslice.